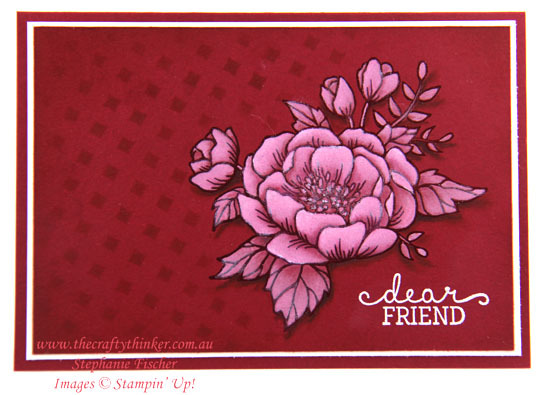 Welcome to the monthly Stampin' Dreams Blog Hop. 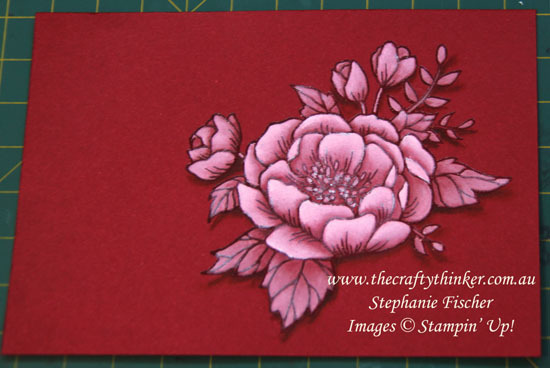 You are currently visiting Stephanie Fischer (The Crafty Thinker) from Australia. I hope you enjoy my project Casing the beautiful new Catalog. 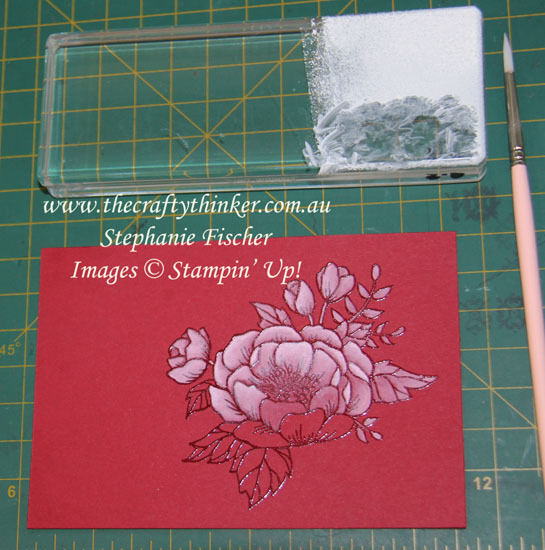 I clear heat embossed the gorgeous bloom on Cherry Cobbler cardstock and painted it with Whisper White Craft ink which is a process I find enjoyable and soothing! 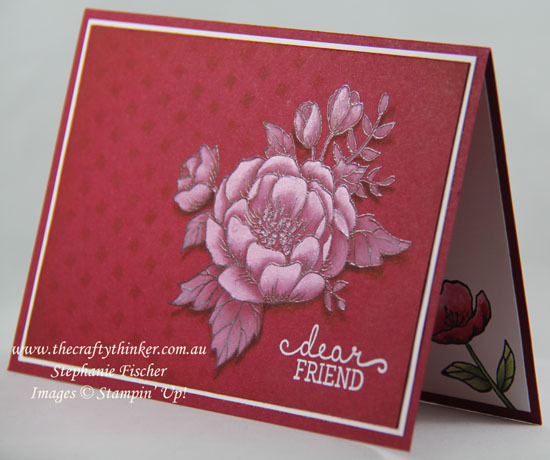 The greeting is white heat embossed and the shadows are watercoloured with Cherry Cobbler ink. The background pattern was created with one of the Pattern Party Masks and Cherry Cobbler ink before I sponged more Cherry Cobbler ink around the edges of the piece. 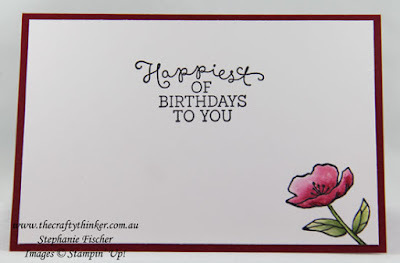 The Birthday Blooms stamp set is one of my all time favourites! I added a layer of Whisper White to break up all the heavy Cherry Cobbler and balance the white highlights in the flower. I've included some pictures of the piece in progress which give an idea of my method. When using white craft ink, I generally work from top to bottom to minimise my chances of smudging the ink with my hand because the white stays sticky and wet for a long time. I gradually build up layers of white - starting lean (not a lot of pigment) and ending fat (pretty much pure pigment). The small flower inside the card is stamped in Basic Black Archival ink and watercoloured with Cherry Cobbler, Lemon Lime Twist and Wild Wasabi inks. 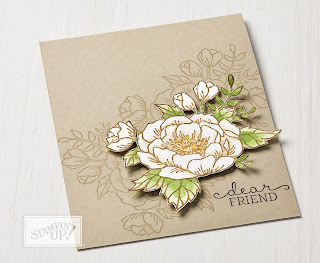 I hope the project you've seen here on my blog today has inspired you & brightened your day. You are currently visiting Stephanie Fischer. Please see the list below & hop through all of the people on the list to see all our projects. You don't want to miss any! You've Got Style, Champagne and Balloons!